Is there anyone alive that hasn't gotten to the point where they can't tell one Dynasty Warriors game from another? I'm there. The nice thing about the series, though, is that the formula is solid...if a little archaic. Chances are if you liked Dynasty Warriors 2, then you'll enjoy most of the sequels. 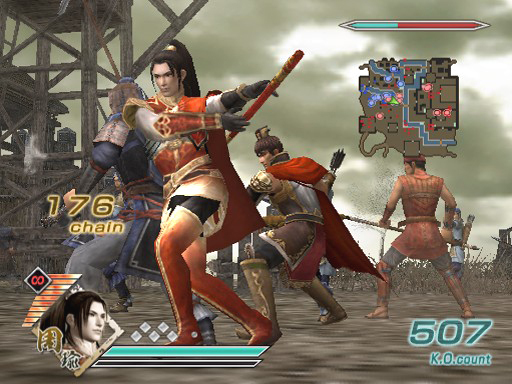 Most recently, we saw the release of Dynasty Warriors: Strikeforce, a PSP-only title that even offered a free four-player co-op demo. While we don't get a free demo this time around (not yet, anyway), Koei is fixed to port the Playstation 2 title Dynasty Warriors 6: Special to the PSP. Ad hoc co-op is confirmed by the source for two players. While this is detrimental considering the current lineup of four-player co-op PSP games, this particular title is a port from the Playstation 2, which has traditionally only offered two-player co-op due to its dual controller out-of-the-box hardware. According to the magazine, the new PSP title is based off the PS2 version of the game, offering 24 battle fields and stories for 23 generals. PSP players will also be able to use Moukaku, who was added for the PS3 and Xbox 360-only Empires update. Of course, the PSP will have one thing you'd expect of a portable game: wireless co-op play. The game's Musou and Free modes can be played simultaneously by two. The release date is set for September 3rd in Japan, but given Koei's aptitude for scraping the bottom of the bean pot, the U.S. and PAL territories will likely see a release shortly thereafter.